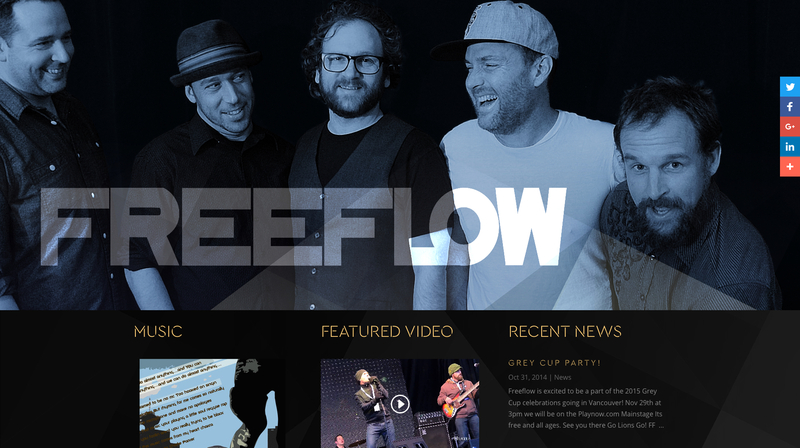 Vancouver Reggae, Soul, Rock & Roll band Freeflow contacted SS Media Co to redesign their current website. 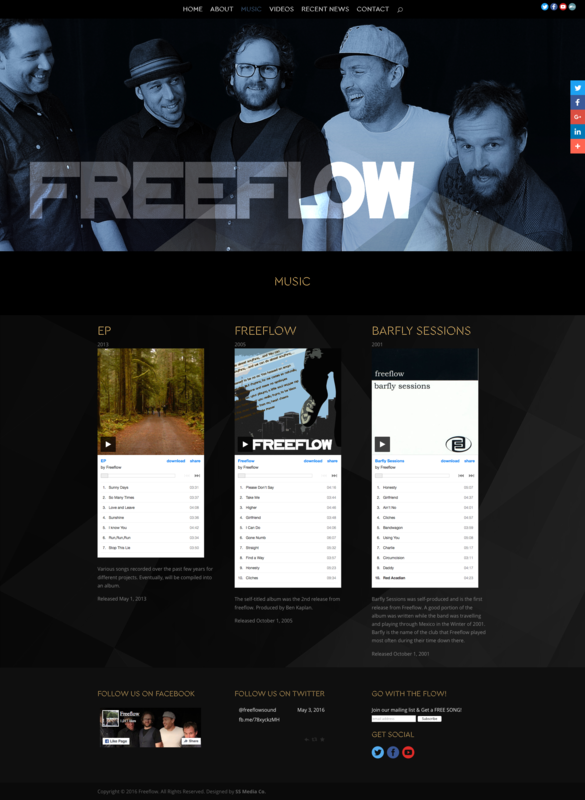 This is the second website we created for Freeflow, the original website created 2009 was due for a revamp. The 2016 version was developed as a responsive / mobile friendly website, which allows the content to look its best on all screen sizes. Who is Freeflow? While the answer is simple in the sense that they’re a flat-out captivating group of musicians that have a remarkable ability to bring people out of their seats, singing and dancing along. Since founding members Jason Evans (vocals), Reece Worth (guitar), Ryan Davis (drums), Wilson Padmos (keys) and Simon Davies (bass) came together in 2001, the band’s music has evolved – something that is more than obvious to anyone who has seen the band live or listened to Freeflow’s three well-received albums. In 2011, Freeflow tragically lost founding member Wilson Padmos to cancer, which was devastating on many levels, forcing the band to do some soul searching, and question how/if they were going to continue. The group chose to keep the light shining, and the single So Many Times, released in 2012, is a dedication to Wilson, and an everlasting keepsake in the band’s historic tour. In 2013, Freeflow added keyboardist Ian Lemont to the mix, and with their new band member have been actively performing, with plans to release a new album on the near horizon. Looking ahead to their fifteen year anniversary in 2016, Freeflow feels a real sense of excitement that the passion for what they do is ever present, and the future is filled with hopes, opportunities, and amazing possibilities. The Music & Video pages showcase the bands content by way of Bandcamp and YouTube, keeping all content easy to manage and share. 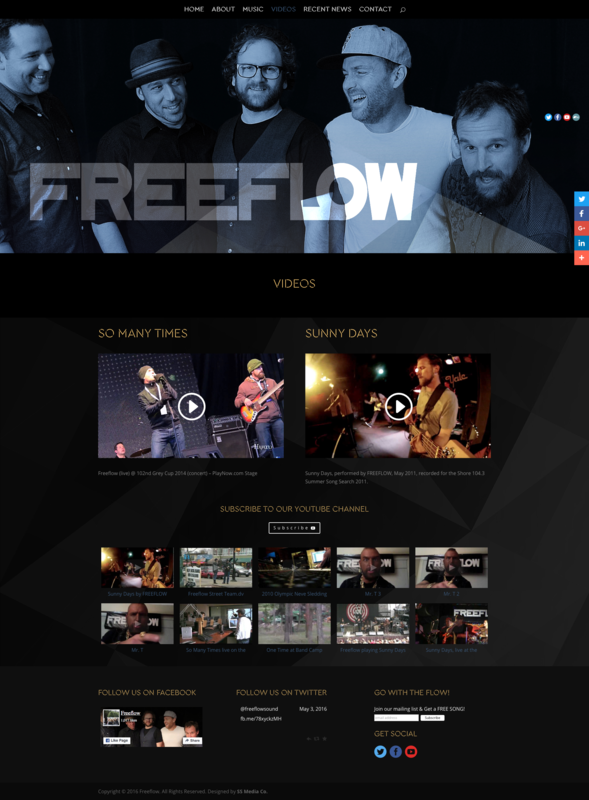 Back in 2009 Top 20, Peak Performance artist Freeflow hired SS Media Co to design and develop their website. A great tool for the time, the site had aged gracefully but after years of service, the website was due for an overhaul.